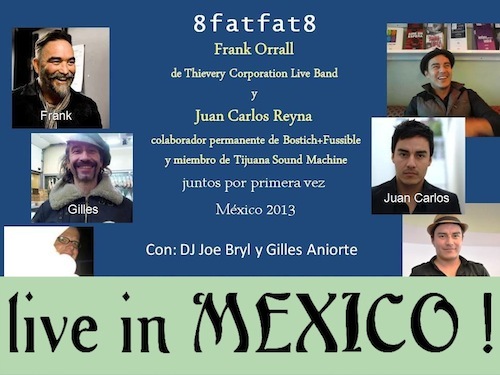 8fatfat8 founder; Frank "Opah" Orrall is also a founding member of POI DOG PONDERING, and is a member of THIEVERY CORPORATION's Live band (where he plays Percussion and Sings). 8fatfat8 LIVE in Mexico City with Juan Carlos Reyna colaborador permanente de Bostich + Fussible, Gilles Aniorte-Tomassian & Joe Bryl...Agosto de 2013...México D.F. 8fatfat8 is Deep grooves and soaring strings, with soulful vocals gently setting the stage for the music to do the speaking & to move the dance floor. From Deep House to Mid Tempo funky to Lounge Chill. _______________________________________________ 8fatfat8 is named after a bar in Honolulu Hawaii. Home state of founder Frank "Opah" Orrall. Opah relocated to Chicago in 1992 and emmersed himself in Chicago's fertile dance community. Joining forces with vocalist Charlette "Truffle" Wortham in '98, 8fatfat8 was born. Under the encouragement of Obi Nwazota, owner of the Gaijin Hotel, Opah began a weekly live p.a. residencey in the lounge. Obi gave 8fatfat8 the forum to do whatever they felt musically. This record reflects that freedom. This is Soul music. 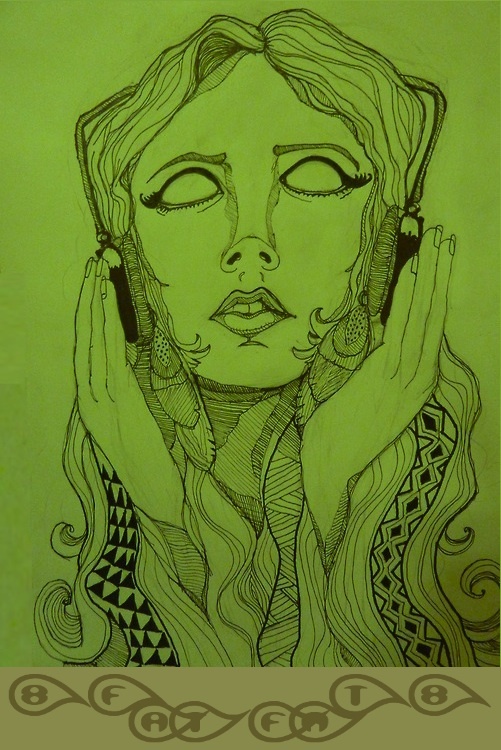 Body music. Meditative music. _______________________________________________ 8fatfat8 further developed it's sound during a noted residency at Mad Bar & at various clubs around Chicago ( Le Passage, Slick's Lounge, Karma, Red no. Five, Smart Bar, Metro, and Zentra) & has earned respect from the Chicago house community. Live, 8fatfat8 is rooted in the live p.a. tradition; combining MPC driven beatz, bass and keys, vocals, live percussion and a host of guest musicians including Alison Chesly (cello) and El John (percussion). 8fatfat8 has released 12"s for Afterhours, Platetectonic Music, and Music 101. ___________________________ 8fatfat8 has performed live in S.F., Chicago, Hawaii, New Orleans, Austin, Bordeaux (France), Miami (wmc), and opened for Groove Armada @ FABRIC in London. Frank Orrall also holds down the live percussion duties and sings for Thievery Corporation on tour.